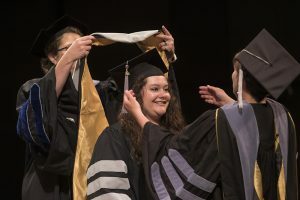 The 112 members of the University of Missouri College of Veterinary Medicine Class of 2018 were encouraged to believe in their own resiliency during the CVM commencement held May 11 in Jesse Hall. Michael Lairmore, dean at the University of California Davis School of Veterinary Medicine, gives the keynote address during the CVM graduation held May 11. Keynote speaker Michael Lairmore, DVM, PhD, a member of the MU CVM Class of 1981, told the graduates that they had each already overcome barriers and faced down doubt from others and themselves. Some individuals may have endured heartbreaking events. Lairmore, dean at the University of California Davis School of Veterinary Medicine since 2011, said his own resilience began to form at an early age, when he was hospitalized with encephalitis and fell into a coma. After his recovery and throughout his life, family members told him he was lucky to have survived the illness. Such comments drove him to prove why he had been given a second chance. As one of the world’s newest DVMs, Chad Landes offers an emotional and laughter-filled response on behalf of his classmates. 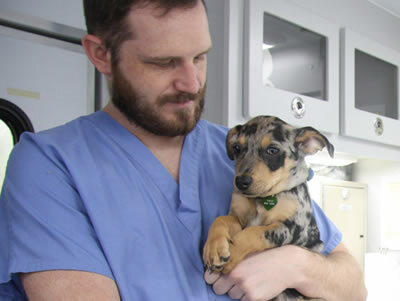 Upon graduation from the CVM, Lairmore took a job as a large animal veterinarian at a rural practice in Pennsylvania. The birth of his first child prompted him to seek a career path that was more conducive to spending time with his family. He was accepted into a combined residency and PhD program at Colorado State University. “I felt alive and excited about entering this next stage of my life,” Lairmore recalled. Once in graduate school, Lairmore chose to pursue studies in a lab that researched viruses of cattle and sheep, another decision that would ultimately change the direction of his career. During one particular lab meeting, Lairmore’s advisor shared a fax he had received that included an image of a virus that looked exactly like a sheep virus being studied in the lab. But the virus had not been isolated from a sheep, it was from a person in San Francisco dying from a mysterious immunodeficiency condition. It was the beginning of the AIDS outbreak. Associate Deans Linda Berent (left) and Angela Tennison hood Rebecca Cooper. Upon completion of his PhD, Lairmore accepted a position as a staff microbiologist at the Centers for Disease Control in Atlanta, Georgia, and shifted his interest to study human retroviruses. 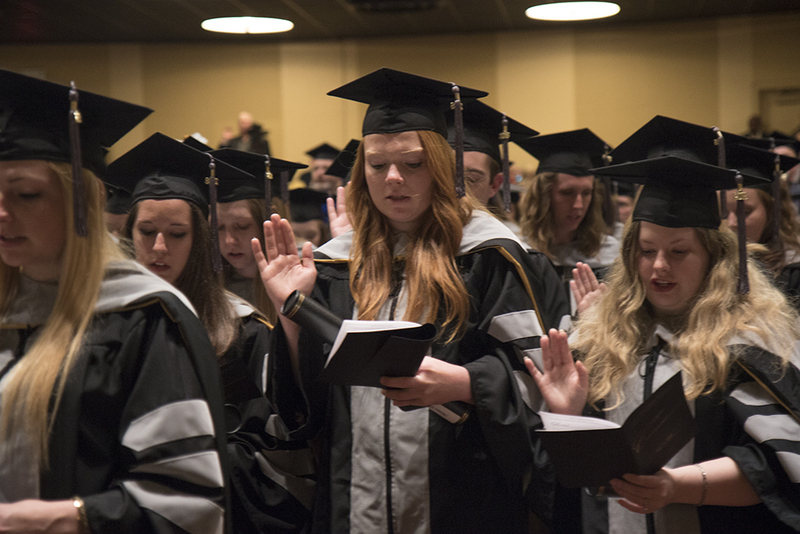 Led by Missouri Veterinary Medical Association President Cindy Penrod, the new DVMs recite the Veterinarian’s Oath. CVM Dean Carolyn Henry, DVM, MS, marking her 100th day since being named the college’s permanent dean, introduced Lairmore and served as the emcee for graduation. 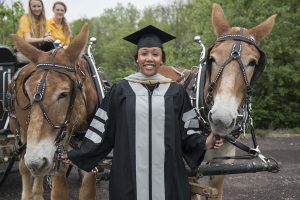 Assistant Teaching Professor Jill Luther, DVM, MS, representing the CVM Alumni Association, asked the graduates to seek out reunion opportunities and their fellow alumni to serve as mentors as a means to stay connected with their alma mater. 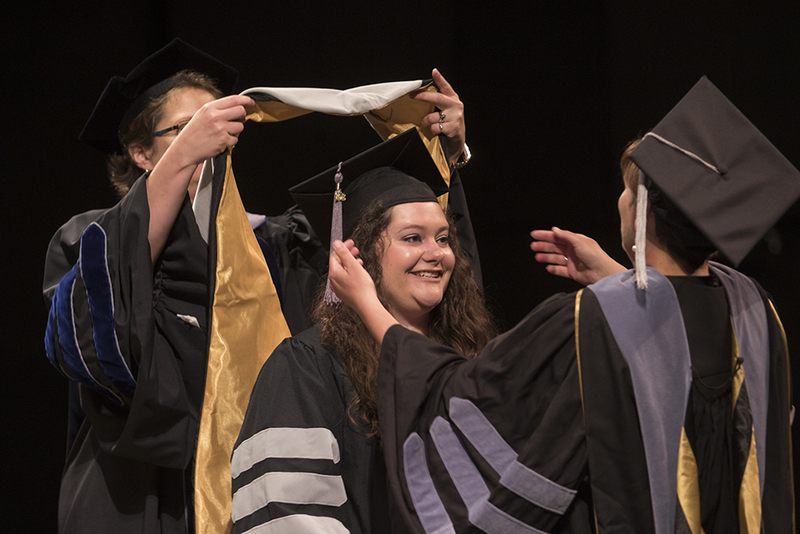 Prior to the investiture ceremony, the college recognized graduate students who were completing master’s and PhD degrees. Veterinary Health Center Director David Wilson, DVM, MS, then presented veterinarians completing internships and residencies at the CVM. Flanked by the CVM Mule Team, Tim and Terry, Christen Robinson poses for a keepsake image of her time at the CVM. Ron Cott, DVM, alumni advocate, presented the graduating class for investiture, which was conducted by Linda Berent, DVM, PhD, associate dean for academic affairs, Angela Tennison, DVM, associate dean for student affairs, and Jeffrey Bryan, DVM, MS, professor in the Department of Veterinary Medicine and Surgery. Assisting in the ceremony were Associate Clinical Professor Brian Frappier, DVM, PhD, and Associate Teaching Professor Cathleen Kovarik, DVM, PhD, both from the college’s Department of Biomedical Sciences. 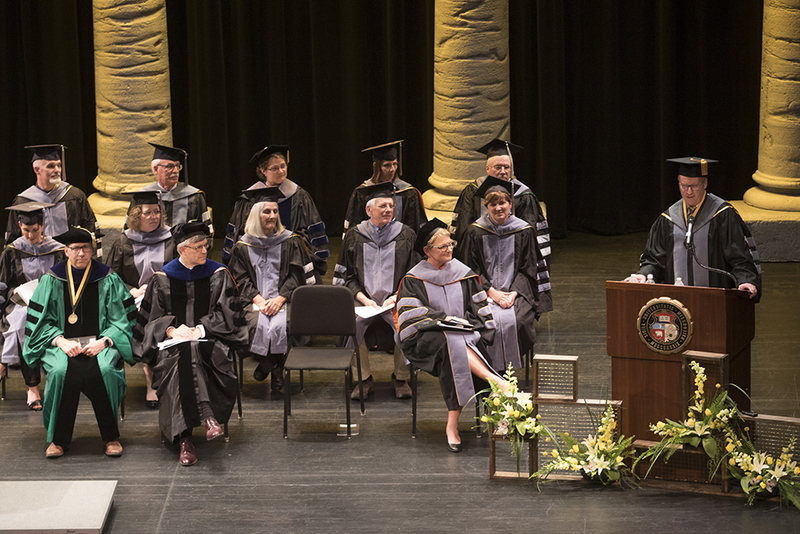 MU Interim Provost James Spain, PhD, conferred the doctor of veterinary medicine degree to the class members. 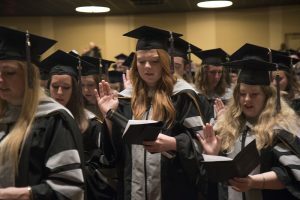 Missouri Veterinary Medical Association President Cindy Penrod, DVM, led the graduates in reciting the Veterinarian’s Oath. His classmates selected Chad Landes to give a response on behalf of the Class of 2018. 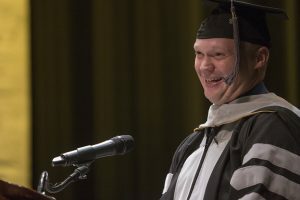 Landes spoke about the academic challenges he had faced early in the veterinary curriculum and how a classmate had come to his aid after he shared his test scores on the class Facebook page in an effort to boost the morale of anyone else who might have been struggling. 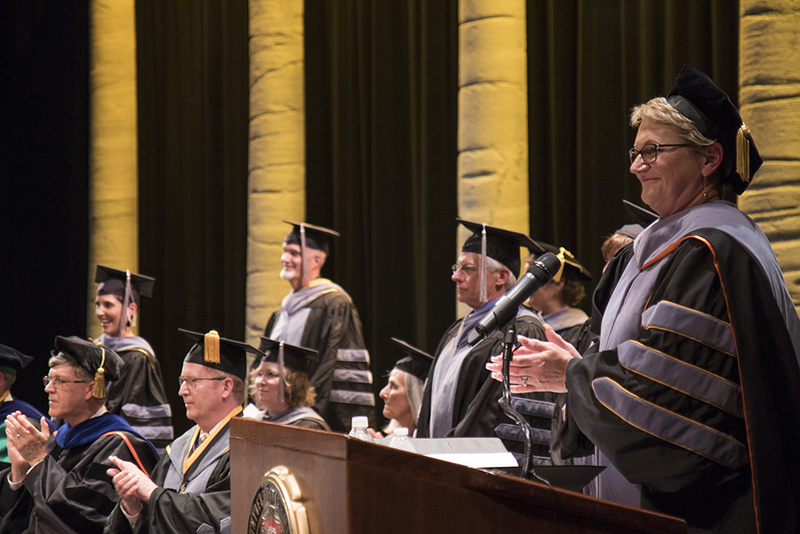 Carolyn Henry celebrates her 100th day as CVM dean by serving as the emcee for graduation. She thanks the graduates for the contributions they made to the college during their education. “She tutored me at least once or twice a week, making sure I never had to face that kind of failure I faced early on,” Landes said. “She made it her business to be an expert in every subject matter, just so that she could help me out. We had not developed a friendship up to this point at VET, our freshman orientation. We were mere strangers in the same anatomy class, first-years in it together. Not once did she ever ask for payment, even if I offered. She would follow up with me on every exam, asking me how I did, to make sure that I was doing ok, both mentally and academically. “It didn’t matter if she felt ill, if she felt unprepared for the exam. She even had an unfortunate life event happen to close family members. Not once did it faze her. Not once did she make an excuse not to help me out. If it wasn’t for the kind soul of Ashley Walker Potts, I would not have the opportunity to walk across the stage today,” Landes said. He went on to recount how other classmates had also stood in solidarity and support for each other. “I wasn’t the only one who struggled,” Landes recalled. “I saw people from the front of the class, succeeding academically, paying it forward. Reaching back to those in the back of the class, making sure that they were taken care of, making sure that they were able to achieve their lifelong goal of becoming a veterinarian. I saw determination, continuity, camaraderie, and a level of generosity and chemistry I have never witnessed from such a large group of people. Those who needed rope were given rope by those who had extra to give. It wasn’t just some individuals who had miles of excess rope to pass on to others. It was from individuals with mere inches of twine. They hacked theirs off and gave it to those who needed it. It was at that exact moment that I could not have been more humbled and proud of the Class of 2018,” Landes said. The graduation was also live streamed, and a copy of the recording can be viewed and downloaded here. A photo gallery from the graduation ceremony can be found on the CVM Facebook page.